The company's camera features focus on creating an open developer platform for augmented reality. Facebook's efforts to embed camera functionality in all the apps it runs isn’t just a push to crush Snapchat. The company will be using those cameras as a way to create a developer platform for augmented reality, CEO Mark Zuckerberg revealed Tuesday. Developers and artists can work on building augmented reality camera lenses with AR Studio, a new development environment that Facebook released in closed beta. The environment offers users tools to make it easier to create augmented reality scenes like masks and other overlays that react to the scene around them. 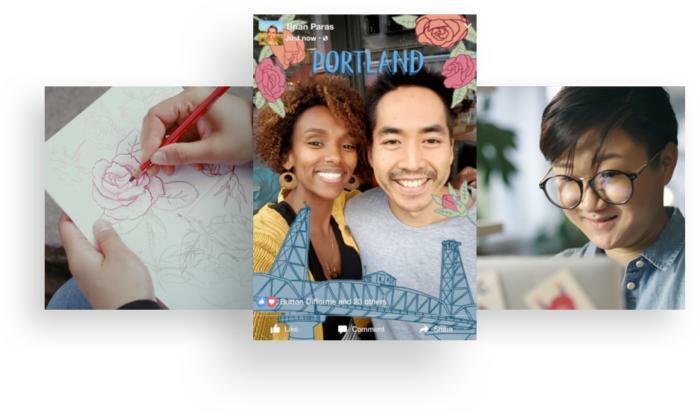 Starting Tuesday, artists can also design custom frames for the Facebook camera that will overlay images over a photo or video, much like Snapchat's current platform for its lenses. Zuckerberg positioned the camera push as the start of an open developer platform for augmented reality that will feature additional capabilities as time goes on. For example, he showed off a camera feature displaying digital text on a physical image that would appear to stay in the same place as a viewer walked around. The features are similar to features Snap has added to its Snapchat photo-sharing app, including augmented reality functionality it also launched Tuesday. "What Facebook rolled out today in AR was compelling and is designed to embrace, extend and then ultimately crush Snapchat," Patrick Moorhead, president and principal analyst at Moor Insights & Strategy, said in an email. For example, Zuckerberg demonstrated an integration with Nike+ Run Club that overlays a user's running progress over a selfie. Another example showed off an augmented reality piece of art at Facebook's headquarters. While it's a blank wall in reality, an animated piece appears when viewed through the Facebook Camera on a smartphone. Don’t expect the Facebook app to suddenly spawn a bunch of augmented reality features overnight. It will take a while for the company to roll out new capabilities, and then even longer for developers to take advantage of them, Zuckerberg said. This new AR push doesn’t mean that Facebook is giving up on virtual reality—far from it. The company also showed off its first social virtual reality app on Tuesday. "Virtual reality and augmented reality go hand in hand," Zuckerberg said. The research Facebook is doing related to VR has also translated into benefits for its AR program. Facebook's Oculus team is using a technique known as simultaneous location and mapping to help with motion tracking for a prototype untethered VR headset. That same technology is being adapted for the overlay capabilities demonstrated Tuesday.